Millennials word cloud. Photo courtesy of Shutterstock. When it comes to today’s workforce, there is no doubt that millennials are creating an atmosphere of change in the workplace. So, who are millennials? This group was born between 1980 and the year 2000, and reflect a generation with their own career goals, attitudes, and oh yes, their understanding of how to use technology. For employers to take their companies to the next level, they will need to find ways to recruit and retain millennials, also known as Generation Y. 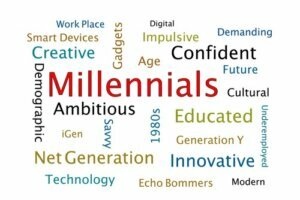 Employers, do you believe you have an understanding of the millennial generation? Some of you might say yes, which could indicate that you are around them in the workplace. It may also mean that you believe they are the future of your business. Even so, you should not take millennials for granted, as though they will remain with you long-term. As an employer, you must earn their respect and trust. Even if you accomplish that, millennials are open to other career opportunities such as working for competitors or starting their own businesses. According to one study, 35% of Gen Y employees have become entrepreneurs to earn extra income. So, what else should employers know about these modern workers? Work/life balance is a priority – While millennials understand the importance of working hard, they also value being able to enjoy their personal lives. The expectations of work/life balance have been better than some millennials had thought but for others, not so much. Achieving this balance gives employees some level of satisfaction for any additional hours they put in, especially if they don’t receive compensation for them. Technology rules – Millennials want to communicate on the job the same way they do in their social lives. For most of them, that means using technology. In the same study mentioned before, 59% of millennials said that technology is an important factor in choosing a new job. If not doing so already, employers may want to incorporate modern day tools to improve communication and productivity in their companies moving forward. It is important for employers to get a better perspective of millennials if they want them as employees. Employers need to gain the respect and trust of this generation. If and when they are hired, millennials should not be taken for granted, as they are open to new opportunities to benefit their careers. In the next article, we will focus on attracting millennials. To read previous articles in The Millennial Makeover series, click on the links below. We believe that every student and recent grad deserves a great career. Get a personalized proposal for how best to reach your target candidates by entering your info here. We will respond within one business day. Thank you for submitting your request to College Recruiter for a proposal for how we can help you hire students and recent graduates of one-, two-, and four-year colleges and universities for part-time, seasonal, internship, and entry-level opportunities. We will likely respond within a couple of hours and definitely within one business day. Should you need assistance even faster, please call us at 952.848.2211 or email us at [email protected].